J.W. Northrup and Terry Irving are writers. They feed on the food of writers. The words they can create, compound and put together take them to new places. 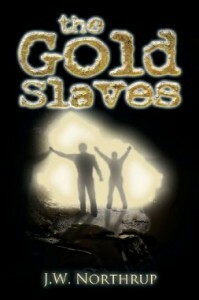 I wanted to interview these two writers about J.W’s bestselling book “The Gold Slaves”. The Gold Slaves are enslaved humans who have been trapped underground with lies. The lie is that they must mine gold for the Gods. They have no idea about the outside world. The truth is that they have been swindled, conned into mining for the Rockwell mining company. Creator of “The Gold Slaves,” J.W Northrup. Nick: J.W. meet Terry- Terry meet J.W. Terry: Mr. Northrup, an honor! Anyone who can run a marathon with the runs is a hero in my book. Terry: Yeah, I wouldn’t even have been ABLE to run straight. J.W: I was crazy in those years. I’ve outgrown them. Terry: When do we begin, Mr. Moderator? What is a “Gold Slave,” J.W? J.W: A Gold Slave is a miner raised in total ignorance of the surface, believing the universe is solid. Terry: Sort of like Wells’ Morlocks? Do you think they really exist in our world? J.W: I think brainwashed people do. Yes, a similar type of thing! Terry: It’s very difficult to brainwash people. I’ve read the memoirs of several of the guys in Hanoiand it didn’t take. Nick: You wrote extensively about the propaganda of the Vietnam era in your novel “Courier,” Terry. Do you think the majority of Americans were brainwashed by Nixon? Terry: Brainwashed? NO. Hogwashed, whitewashed and swindled, yes and betrayed, if you believe LBJ. Nick: So, I guess there could be comparisons between the Gold Slaves and the American public of 1970 in their naivety towards the world they live in? Terry: No. This is the most upwardly mobile society in the world – still. And more people can change to a different economic strata than anywhere else. It’s less so than, say, right after World War 2but it’s still not bad. Back to brainwashing… Were the Gold Slaves brainwashed or did they just never SEE the surface? J.W: They were brainwashed by the discoverer of the gold to keep it secret and keep the gold for himself. Nick: Brainwashed or misled, J.W? J.W: Brainwashed using the techniques of Brainology. My book was part of a story about viewpoint. The Gold Slaves were very sane, but from our viewpoint, they would be considered to be insane. Nick: Who would you see as resembling gold slaves in today’s world? J.W: Good question. I think people who are completely tied into the “Brain is everything” concept, and we are just computing neurons crowd. Nick: J.W, Terry- this is for both of you- do you believe a world like that of the gold slaves would make us happier people? Terry: If the gold slaves were happier and convinced that the surface people were barbarians, why would they have to brainwashed? Sounds like they had it right–for them. Terry Irving, with an opinion on his lips. J.W: The mining company had to find a way to hide the mining operations and thus secure the gold for themselves. But after they were “disconnected,” the Gold Slaves developed a marvelous society based upon a crazy assumption. Terry: Once again, the North Koreans. But their society isn’t as marvellous–just as crazy though. Would you say that the North Korean society would be similar to the Gold Slaves. J.W: How were the North Koreans brainwashed? Terry: Well, they are convinced that the little nutball with the brush cut is a god and that they have the best society on earth. I’d go with brainwashing on that one. J.W: Happens virtually everywhere on this planet. J.W: As I said, it’s all about viewpoint. We’re the brainwashed people to the North Koreans. Terry: Possibly, although since they keep starving to death and their average height is several inches shorter than the South Koreans, I’d say they have a reality deficit. J.W: Yeah, but try to tell them that. They’ll say it’s an advantage. They would call it natural selection. Terry: I don’t know. I was in Berlin when the Wall went down and, despite decades of brainwashing, damn few Germans thought life was better in the East. J.W: I suppose a good police force can be substituted for brainwashing. Terry: It’s essential, really. but all of the Soviet bloc was worked over for 50 years and it simply didn’t take. The other problem is that you have to make sure that the police force is brainwashed as well. The end of East Germany came when the rulers realized that the VoPos (Volkspolizei) were not going to fire on the people chipping at the wall. Although, there are still a lot of East Germans who thought the old days were simpler and more fair. Sort of like radical Democrats all over. Well, it sounds fascinating. Jim, I’m going to have to read it. J.W: I think you will enjoy it! Nick: Thanks for the debate, Terry and J.W. A Live Interview With J.W. Northrup! | Novel Ideas | Hey Sweetheart, Get Me Rewrite! It’s Happening Tomorrow: Terry Irving’s First Urban Fantasy Novel #mustread #urbanfantasy #kindle #new | Hey Sweetheart, Get Me Rewrite!